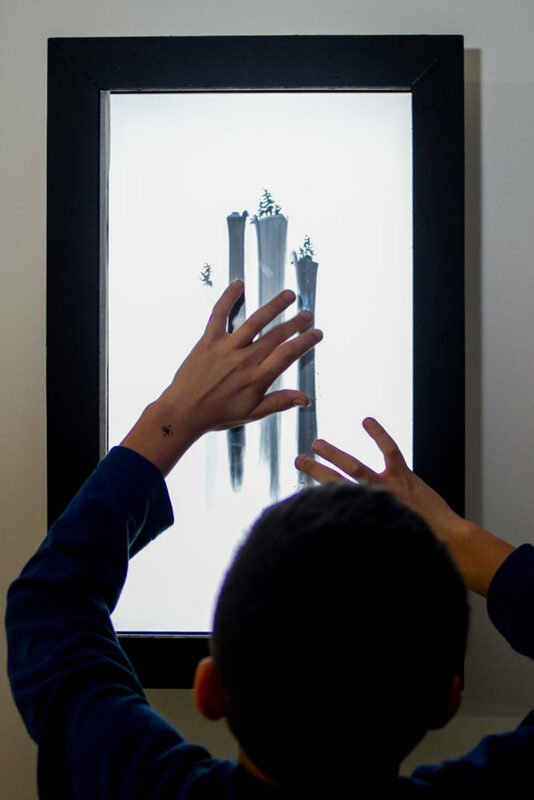 “Ink Fall” is an interactive installation which uses advanced digital techniques to make ancient Chinese paintings vividly alive. It traces back to 3000 years ago, when Chinese artists started to make Shanshui [waterfall and mountain] ink paintings. In contrast to accurate and very well detailed Western oil paintings, Chinese paintings were only very little related to accuracy and details. On the contrary, what is much more important and emphasized in Chinese ink paintings is the atmosphere. The fluid atmosphere brought by moving water. But the ancient artists’ representation was limited to the traditional techniques. Once painted, the ink wouldn’t move, thus viewers could only perceive this fluid atmosphere using their imagination. This installation, “Ink Fall”, experiments with bringing this concept to reality by using modern digital techniques. The software uses more than 4000 ink traces, and numerous particles to simulate the move of ink waterfalls by composing continuously moving ink traces and particles. When the viewer touches the screen, a disturbance is introduced to the software environment, ink traces are split around viewer’s fingers, and ink drops explode from there too. What’s more, sounds of koto strings are also triggered by each touch, and then fuse into the never ending movement of the water inks. Born in Beijing in 1988, Seph Li has a mixed background in technology and design, and his keen interest in interactive art works led him into the field of media arts. Seph studied Computer Science and Entertainment Design in Tsinghua University and did his M.F.A. in Design | Media Arts at UCLA. Seph has been experimenting with the role of interaction in storytelling using different forms, and also expanding his visual and conceptual vocabulary using installation, sculpture, video game, product prototypes. Instead of using interaction as supportive features, Seph insists interaction itself should be an independent form. works have also received several notations by online medias such as the Creators Project.